I always find religious statues a bit creepy and this one is certainly no exception. 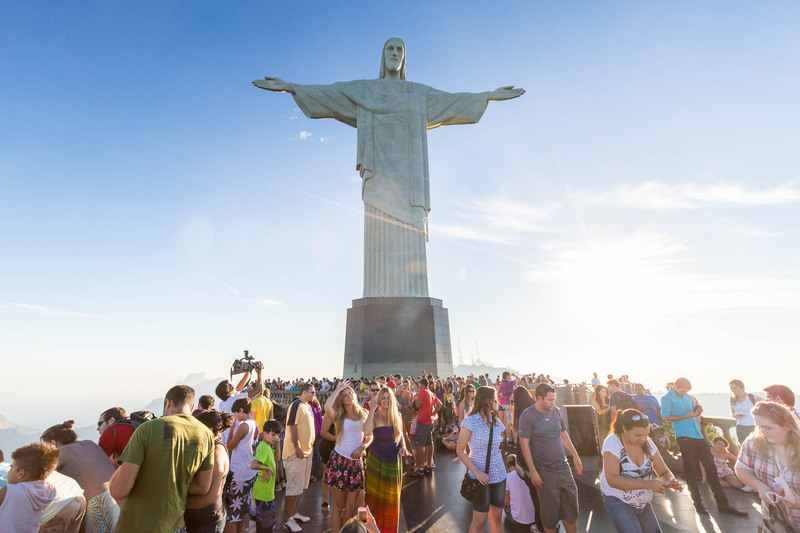 A colossal 40-metre high concrete depiction of a man who lived during the Roman Empire, died, reportedly came back to life and now many people worship as God should be creepy, I guess. What should be human emotional eyes are giant concrete balls several metres away from a ridiculously pointy chin. I’m in awe of the architectural feat but also unsettled by the crowds of people mimicking it in trashy summer outfits and taking endless photos on their smartphones. While I enjoy the colourful complexity of this image and the memory of myself posed like that cameraman in order to take it, I also remember my reluctance to even visit this infamous statue at all. One of the wonders of the modern world and an ironically iconic representation of Brazil’s party town, I begrudgingly took the train to the top of the mountain to see it as one of those things you ‘have to do’ when you visit Rio de Janeiro. Besides, I was in town to shoot stock images, and I couldn’t miss this one. Sure the view of the city sprawled out over islands, bays and endless beaches on all sides is vast and beautiful. Sure, the crowd is fun and playful like the city below. Sure the religious statue is impressively immense and sombre. But the whole thing is creepy and I was back down the stairs and pushing my way into the line for the return train as soon as I packed this shot.